Happy September! Oh, I felt my reading get interrupted this week! This was our first full week of school and my reading was really interrupted. I quick read 4 books on release days this week, but the rest of my reading happened over the long weekend. I crammed it in! My initial reaction is where was the story? I felt like the entire story was a buildup to the main story. The main story just never happened. But if you go back to the tagline of the book "a story about believing", then you think a little bit more and realize that's what it's about. Believing. There is no other story needed. The standout of this book for me was the illustrations. Very reminiscent of the artwork of Mary Blair (Disney's it's a small world). Stunning. I'm in love with Elliot. Beautiful story about friendship, helping each other, and how sometimes you can feel really small. Loved it. Fly Guy is such a great hit for younger readers. And this one includes the word Booger in it, you know kids will love it! I actually thought this would be a great picture book to use in an older classroom. I think the concept of self-worth could be explored with an older group of students. Yeah, he really is that good. Love this book for questioning, figuring out what the whole story is about (don't let kids get wrapped up on each page, they miss the whole picture!). I wish there were more and more informational texts like this one. Written by the Elephant Scientist author, this book zeroes in on a baby elephant and gives important information about her life and how she survives but is written on a level for primary students. I love the "Scientists in the Field" series and wish there were more like this book for the younger students. Authors like Jenkins and Bishop have written books for younger grades and we need more like them to make science come alive for young readers. What a great read to finish on Labor Day weekend, the close out weekend of summer! I loved the story of Frankie and Frankie. The book explored such tough topics - the feelings of failure and of hope. Not knowing the future, not knowing what isn't being said. This is a book my middle grade/teenage self would have loved reading. This is a book that is full of soul and hope. I'm more than halfway done with this book and love it. I think middle graders will really enjoy Poppy's story! It's a mystery and a ghost story. Kids are going to love it! This book is beautiful. Absolutely savoring it. I'm reading it just pages each day because I don't want it to end. It's not full of action and adventure, it's not plot driven. It's driven by the soulful and beautiful verse. Love it. After reading Seravallo's Small Groups in Reading book, I thought this would be a natural progression. I think having a strong repertoire of assessments that can be used to drive small group instruction is important. I am excited about reading this because I am reading this version and my reading counterpart is reading the K-2 version and we're comparing notes via google docs. Here's to more learning! 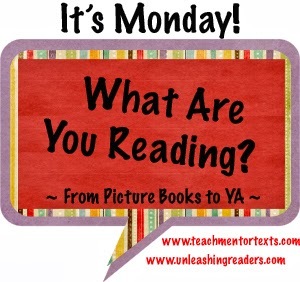 This week I'm going to celebrate making reading VISIBLE! Sometimes we think students "get" reading and what it means to be a reader, but they don't. Sometimes they need to see it. I'm a reading specialist in a K-4 building, and the past couple of years, it's been my mission to do this - to show kids books and make them want to get their hands on books. I get the "itchy finger syndrome" any time I walk into a bookstore. It's when my fingers are just itching to pick up and look through all the books that are there. I want kids to feel that! I think the "itchy fingers" start for me because I know what I'm about to find when I get into a bookstore. We need to teach kids what lays ahead for them when they walk into their classroom library or school library. It can be overwhelming and sometimes they need direction. Or maybe they need a challenge, a new direction. I try to make that direction visible by constantly putting up new bulletin boards and posters. A new picture book and chapter book are highlighted each month. stars they would give the book. 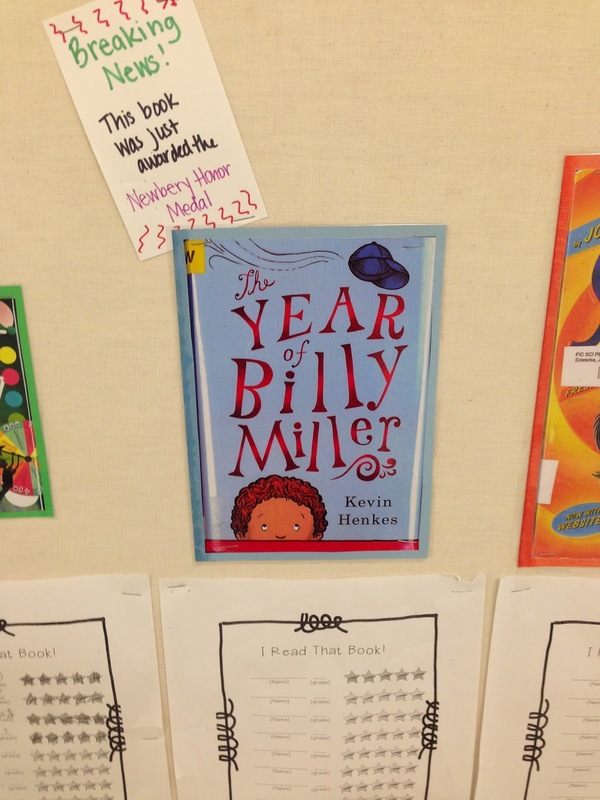 We knew Billy Miller was going to be a great book! Introducing kids to the idea of a TBR pile! My 2014 TBR pile. I just posted my new one this week! These posters are from last year. I've already started adding some new ones this year and have ideas for other posters. * my colleague and I already have our new "what is Mrs. ___ reading?" signs. For the record, I'm reading The Time of the Fireflies and Mrs. Fornero is reading Life on Mars. * the next poster that is going up is going to spotlight the previous month's new releases. Going up soon include covers of The Fourteenth Goldfish, Dash, 365 Days of Wonder, Quest, Little Elliot Big City, Always Abigail, Flashlight and many more. What a month August was for new releases! * I am going to put posters up of the books that are on our state Monarch and Bluestem Nominee lists. * Last year I followed along with Mr. Schu and Mr. Sharp as they reread the Geisel winners and Honor books. I posted those books with the year they won the award. It was a great way to shed light on an award most kids had not heard of before. I'd like to continue to bring awareness to all the different award winners. Some ideas are brewing. I know students look at these lists and it makes them think. Teachers tell us that kids talk about the books that we've posted and I've seen other kids write down the titles on TBR lists. How do you make reading and books visible? Share any ideas in the comments! Making an impact. Something to celebrate! This is a new series that is perfect for a primary classroom to use as a brief introduction to genres and other literary formats. Of course, there is no better explanation than using real pieces of work, but sometimes you need to show something quickly to help students wrap their thoughts around something. Two of the books deal with fiction and nonfiction. They both give quick overviews but list all important factors kids need to know. Standard 5 for both kindergarten and first grade is about students being able to determine the difference between fiction and informational texts. These two books are excellent tools to help teach and demonstrate this standard. I love them because not only do they give quick-to-the-point-overviews, but they also go into the different genres. The fiction book includes realistic fiction, adventure, scary, fantasy, historical fiction and science fiction genres. Some of the genres in the nonfiction book include current events, opinion papers/reviews, how to books, and books that explain. Our first grade team is using both of these books in short, mini-lessons, reading just a few pages at a time and creating anchor charts for students to refer to throughout the year. The books in this series use bright photographs to keep the young readers engaged. When showing a genre or a specific example of a format, the books include the explanation on the left side and an excerpt demonstrating the genre on the other side. I think these books are great teaching tools for the classroom. They lay the information out in a very accessible way and make it easy for kids to understand the difference between the genres. 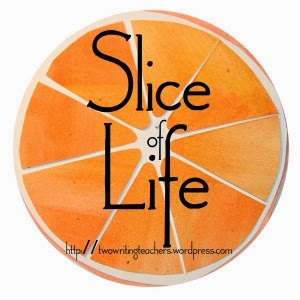 I read a blog post by Donalyn Miller the other day and something really stuck out to me. The post was called Why I'm Not Answering Your Email Today and while it wasn't the subject or topic of the post that stuck out to me, it was some of the smaller points in the text that did. She says, "I need to read for both my sanity and my soul." After reading that, my brain was saying 'yes'. My heart said 'YES'. I need to read for my soul. For me, that's when you finish that good book, and there is something inside you that has just filled up. You don't want to put that book down, you want to talk about it, and you want to go back and read it again. I feel sad for anyone who doesn't know what that feels like. It's one of the most complete feelings you can feel. It moves the inside of you, the thinking and connecting part of you, like nothing else. It feeds your soul. 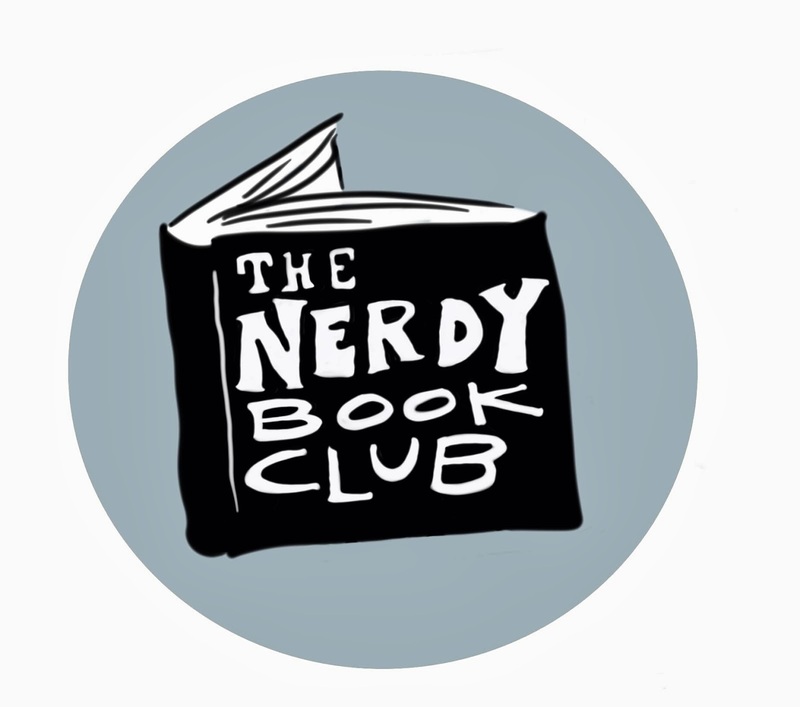 Donalyn continues on in her post talking about reading children's literature. She talks about reading in order to talk about books to students, both past and present. Books connect her to them. 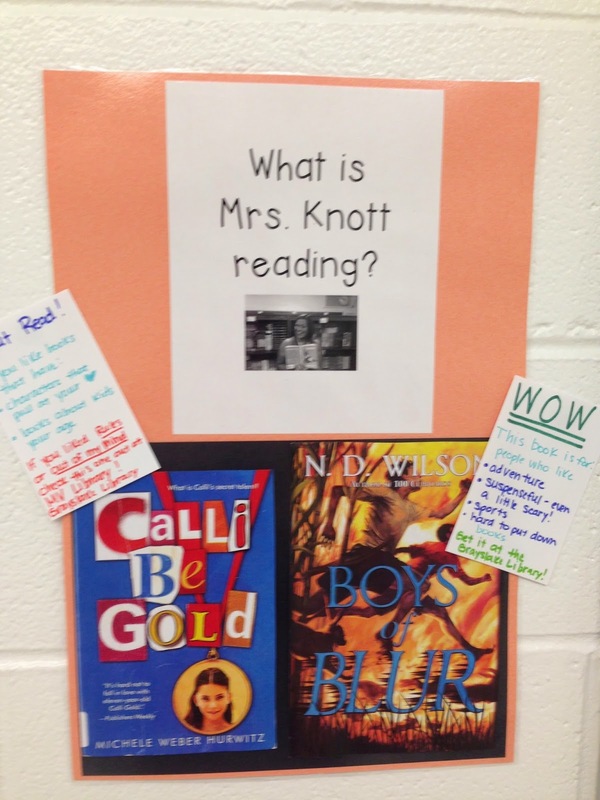 I'm lucky that as a reading specialist, I get to work with many students K-4th grade. I get to read a wide variety of books that allows me to connect with them and share with them. However, I see former students all the time. I love that I have other books I can tell them to read - upper middle grade, young adult. I can stay connected. Donalyn also talks about adult books vs. children's literature. I've read a lot of books for adults. This past year I've read more children's literature than I ever have before. The more I read, the more I prefer kid's books. I still have my favorite books written for adults. There are still authors that I will continue to read every book they publish. But you know what I've found? Adult books are long so they are more drawn out. They take chapters and chapters to say something that ends up being so long, I've lost interest. The characters aren't as developed even though they've had 200+ more pages to do so! Not all of them, but I see it the more and more I read. Children's literature is shorter, so they have a smaller amount of pages to work with. Authors of kid's books seem to understand they have a shorter story to work with and therefore they make everything that much more sharp. The characters are sharp. The details are sharp. Not all of them, but the books I pay attention to, the ones I hear buzz about, those are the good ones. Those are the books I want to get lost in. I'm looking forward to my soul having its fill of books today. What a lucky book birthday it is. Quest, Sisters, The 14th Goldfish, Leroy Ninker, 365 Days of Wonder and in two days Brown Girl Dreaming. Soul filled. Happy reading. One week of school down! Although my reading was slowed, I got to it when I could! I definitely felt the loss of the lazier days of summer when there was a chunk of time I could spend reading! This book is very very similar to Z is for Moose by Kelly Bingham, which I adore, but I think this one is ever snarkier! And I love my snarky books! Although this book was in my library's "concept books" section, this book goes beyond your typical A-Z book. You have to understand sarcasm, play on words and humor to get this book! I was laughing out loud as I read it and I think there is probably a lot you can teach kids about writing using this "concept book"! Thank you, Linda Baie, for mentioning it last week! Zebra: What? I don't get it. Zebra: Why do you do that? Musk Ox: It's all for the ladies. I laughed so hard on that last line! I really enjoyed this book about bears - it covers the 8 different species in a very accessible way for young students. Each page features a main section of information along with a beautiful illustration with additional captions for more information. Thanks, Carrie Gelson, for this title! My goodreads review: I love that Kirby Larson is introducing historical fiction to kids that normally don't read that genre. She makes historical fiction accessible! The story centers around Mitsi, who is Japanese American, living on the west coast during the time of Japanese Internment, right after Pearl Harbor. Mitsi and her family are forced to leave their home, but the hardest part for Mitsi is leaving her dog, Dash. Readers feel for young Mitsi who because of the time and circumstance, feels racial prejudices and grows closer to Dash as a result of her friends turning their back on her. The second part of the story is the history - young readers learn about what happened in the United States during this time period and the history of our own internment camps. More and more children's books are being published to shed light on an area of World War II that wasn't always discussed. Readers are introduced to the living conditions and what families had to go through when leaving their homes and being forced to relocate. Thank you to Net Galley and Scholastic for this early read. Check out Dash tomorrow, it's Book Birthday! This is when I'm so grateful to have found Twitter because it constantly shows me new books to read - not just the current and up and coming books, but the books I've missed along the way. Feathers is one of those books. I'm grateful for Mr. Schu's and Mr. Sharp's Newbery challenge since they are the ones that introduced me to this book. Feathers is a beautiful read set during the 1970s when Black Panthers and afros and jive talk were in, but having to live on the other side of the tracks was also still prevalent. This is Frannie's story and her trying to make sense of that in her world. Woodson creates real characters that come to life in her beautiful telling of their story. pg. 18 "Like Sean. He can't hear, so you have to use sign language with him. He can talk a little bit, but most people don't understand what he's saying. I guess that's because you have to listen real hard and most people don't want to spend a lot of energy on listening to people." pg. 72 "You just remember there's a time when each one of us is the different one and when it's our turn, we're always wishing and hoping it was somebody else. You be that somebody else when you see that boy. You be the one to remember." pg. 80 "I guess the writer was thinking about how light feathers are and they can just float everywhere. And I guess that's how hope is too - all light and everywhere like that." Where it takes place: "I never name the place but was imagining this point between the Brooklyn and Queens border - right near Kennedy Airport. Why I wrote it: "'Feathers' is a book I wrote because I wanted to write about the many ways people find Hope in the world." I'm really looking forward to Brown Girl Dreaming now! I always enjoy Moriarty's books. This one was no exception. I laughed because with it taking place in a school, the snark-iness that comes from certain moms... It was funny! The book was surprising, yet predictable at times. It also dealt with a couple of hot, and very serious topics, bullying and physical abuse. Entertaining read. Ok, Beth and Carrie, I've officially started this one but have barely cracked the spine! Too many library books to get through! This is my week for this book! I have this book on my iPad from net galley and I'm really enjoying it. Definitely a book for middle grade. This book will be released this Tuesday. I'm receiving this book in the mail this week from Leigh Anne Eck and I CANNOT wait to start it! I'm reading this book just a chapter a day on the days that I'm not running from place to place, so it's taking me awhile. I'm getting there slowly! I love the Scientists in the Field series, but they do take me a bit longer to read. Hope you've found some good reads to share! As we start the next school year, I wanted to review the 2015 IL Monarch Awards, particularly the informational texts. Being familiar with them helps me know if any of these books will work for any of our science units. I love Bishop's books. The texts are always rich with information and the photography is outstanding. The colors and textures of the animals seem to come to life and I really like how he puts the size magnification. His author notes are always interesting too - it seems that there is always an interesting, if not humorous story, that comes from his work with animals! The first page is perfect to closely read to look for snake descriptions and come up with generalizations based on them. I also flagged pg 8 to use when close reading as Bishop compares humans and snakes. Great story of how rescuers teach the koala how to survive and then release them back to the wild. Young children will love the photography. This book could almost be used in adaptations as well! I'd also use it for a lifeskill discussion of perseverance. Masterful illustrations. Fascinating story about a specific part of baseball. I could see using this in a unit on inventions that changed America. "First day of school! First day of school!" I can't help but think of Nemo at the beginning of every year. Nemo was so excited to go "get some knowledge". I think I feel more like Marlin... "We go out. Then back in. Then back out. Then back in." I ease into it a bit more. At the end of last year, our principal challenged us to read over the summer and return to school with our reading lists. I don't know where she got the idea from (No, really, it wasn't my idea. Maybe I sparked something in a conversation, but it really wasn't my idea!) but the goal is to get everyone thinking about how they live a readerly life. We need to be passionate about reading and make our reading visible to help kids understand that reading, well, it's what we do. I didn't quite know what to expect. I've seen little glimmers over the summer. I can see what my reading teacher colleague and one of our ELL teachers have been reading over the summer since I follow them on goodreads. But walking into school this past week, just for a few hours, was awesome. I had many teachers come up to me to tell me some of the books they read this summer (see, they still think this challenge came from me. I promise you, it really didn't!). Some had read adult reads. Others had read to their little ones. Some read books past their grade levels and some had read books that they were ready to use for read alouds this year. We had conversations about authors we want to Skype with this year. 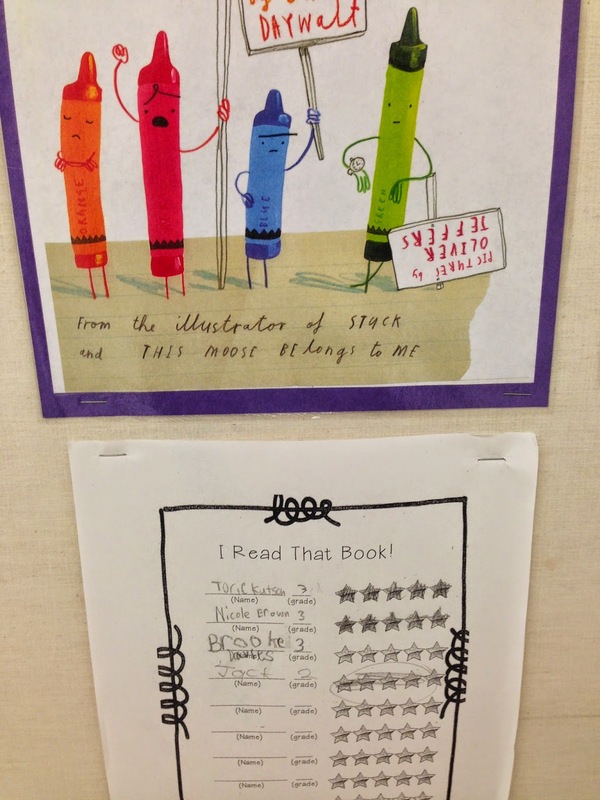 Several teachers showed me how they are making reading visible in their classrooms this year. I didn't come up with this challenge. But I love the conversations that have popped up because of it. I think it's going to be a good year. "First day of school! First day of school!" Ahhh, it's the Back to School edition of #IMWAYR!!! How did that happen? I hope you found some of these books this summer as well! Now onto this week's reading! I love the cleverness is Lizi Boyd's wordless picture books. There is so much to look at, in what seems to be simplistic illustrations. Most of the book is shown in black, white and gray drawings, with the colored part of the picture shown from the light of the flashlight. Using small cutouts, readers guess what will be seen and then what the cut out shows once the page is turned. Boyd's books are ones you need to go back and reread. Read them for the story, then reread to closely look at the illustrations, then reread again to see the details in the cutouts. Then you might want to reread one more time to see if you added anything in your understanding of the story! Litwin does amazing work for the PreK-1st grade crowd. This will be another crowd pleaser. Cute story about the Nut family and the two little Nuts that won't go to sleep. Big Mama Nut has her work cut out for her! Cute story but once I saw the video of Litwin performing it with a young audience, it had me hooked! Cute, infectious song that definitely enhances the story. The story is simple enough - tells all the happenings of a day at the beach. The author does a great job of capturing everything that happens - the busy-ness, the playing, the relaxing, having fun, doing nothing, being in the water, out of the water. This is a great mentor text for writing. I would pair this book with Baseball Is... by Louise Borden and see how the authors take their knowledge of a subject, and use it in writing. 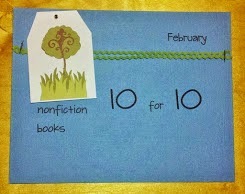 Thank you, Elizabeth, for showing this book on your blog! I'm so glad someone wrote about this text because it is a great one to share in regards to bullying, as well as sticking up for yourself! I liked Otoshi's simple illustrations used to get the point across. Looking forward to Two this September! I read this a few weeks ago, but somehow had not reviewed it. Easy and simple concept that turns into something fantastic. This book is going to be devoured by readers this fall! Lovely book to use when talking about active listening with your young readers. What is causing Buddy to not hear the correct items? What could he do to fix this? What do we learn as a class from this? Thanks to @mariapwalther, she gave me the idea to pair this book with Telephone by Mac Barnett, which comes out on Sept. 9. Lots to learn and discuss with these two books! It's a book about poop. Kids will love it. It is disgusting! This may be the most gorgeous nonfiction picture book I have ever read. Thank you, Carrie Gelson, for another stellar recommendation! I will be using this book as a nonfiction mentor text for 4th grade. I love how the author organized the book. I felt like the author was talking directly to me, the reader, which is uncommon in a nonfiction picture book. Just beautiful. If I could give this book 10/5 stars I would!! This book and Absolutely Almost just gripped me this summer. It's after you read books like this, it makes it impossible to start another book. You just need to think and talk and think about it more! I cannot say enough about the writing in this book. I loved the characters' dialect. The way the story moves. I actually had to stop reading it at night because it made my heart pound so much! It was brilliant. My two favorite lines: pg. 213 "Stories don't have to do anything; they just have to be." pg. 278 "A story helps folks face the world, even when it frightens 'em. And a lie does the opposite. It helps you hide." This has been an amazing summer for reading. I can't believe the wonderful stories I read this summer. This book was no exception to the wonderful part. I can see why that shiny sticker is on the cover of my book. I think this book would be a fantastic book to use with upper middle school kids for a study on character and setting. The main character, Little Man as we come to know him since his first and last name give him so much trouble to say as a result of his significant stuttering, is multi-faceted and gives the readers so many sides to talk about. We of course know him as a stutterer, but what does that mean? What does that do to him? What happens as a result? The setting is quietly placed in the book, but what implications does it have to the story? Would the story be the same if it was during a different time period? This book had me interested in the beginning, and I was gripped by the end. This line made me pause and think, "Two kids don't have to say words because they can say all they need to sometimes with their smiles." (pg. 165) That would be an interesting line to talk about with kids. 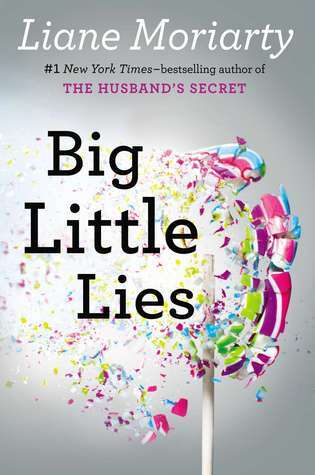 I really enjoyed reading this book and talking about it in an online group. The book's focus is the reading/writing workshop. While the author is a middle grade teacher and all of her examples and ideas are from that grade level, the ideas can easily be adapted for younger grade levels. I felt the book had a heavy emphasis on the writer's workshop. Rief includes some great ideas for setting up the writers/readers notebook (WRN) and what her students are expected to include in them. I really liked reading about some of the ideas she uses in the beginning of the year to give students ideas of what to write about throughout the year when they are stuck. Also loved the quick write concept. This book also included a link to the Heinemann website that has handouts, write ups on ideas and student examples for each chapter. I printed many of them up and hope to use them at some point this school year. I'm so glad someone suggested this book because this book really helped me wrap my head around using strategy based grouping. I've thought about it for years, but always went back to using leveled readers. This book helped me make sense of it and did so in an easy to read and understand manner. I love that the author is on Twitter and I was able to tweet her questions! I'm anxious to give this a try this year. I think this could be a missing link for our groups! I have quite the stack lined up from my did-not-get-to-summer-reading-pile, but it will take me a bit longer now that school has started. But at least I know I have great books to look forward to! And have you seen the Aug. 26 book releases?? I have several coming to me on that day, can't wait!